The Denver Zoo (in Colorado) offers zoo keeper unpaid internships with birds, hoofstock, carnivores, primates, and fish or reptiles. The zoo also has a sea lion/seal program. Students are exposed to animal care, training, diet preparation, habitat maintenance, record keeping, and behavioral observation. The internships are open to college students studying biology, zoology, or a related field. There are three sessions in the spring, summer, and fall with full-time hours for 12-16 weeks. There's also a part-time program that totals 200 hours over the course of six months. The Cincinnati Zoo (in Ohio) offers animal keeper internships throughout the year with winter/spring, fall, and summer sessions available. Interns are involved with diet preparation, exhibit maintenance, observing behavior, and shadowing experienced keepers as they complete their duties. Opportunities are available with manatees, rhinos and hoof stock, amphibians, elephants, giraffes, primates, reptiles, and birds. Internships are unpaid, and the full-time program requires 14 weeks with an 8:00 am to 3:30 pm schedule over a five-day work week (with some weekend days required). There is also a part-time internship over the course of 9 months with 2-3 days per week for eight hours per day. The Fossil Rim Wildlife Center (in Texas) offers animal care internships with carnivores (primarily wolves), black rhinos, and birds. Duties include diet preparation, feeding, habitat maintenance, assisting with some veterinary procedures, maintaining records, video analysis, and completing an independent project. The program is offered in the fall, winter, and summer for upper-level undergraduates and recent graduates. Housing and a $300 stipend are available. The International Exotic Animal Sanctuary (in Texas), the first sanctuary certified by the Association of Zoos and Aquariums, offers either three-month internships in the fall, winter, spring, and summer. There is also a six-month program. Duties include feeding, behavioral observation, habitat construction and maintenance, record keeping, health management, and educational presentations. Applicants must have completed at least two years of college in a zoology, biology, animal management, or a related major or have three years of experience at another AZA-certified facility. Interns receive free housing, use of a vehicle, and a weekly stipend. The Conservators’ Center (in North Carolina) offers wildlife keeper internships where students can work primarily with carnivores (such as tigers and other big cats). Interns shadow experienced keepers and learn to perform duties such as food preparation, cleaning enclosures, transporting animals, providing behavioral enrichment, keeping veterinary records, and utilizing physical or chemical capture techniques. The 12-week intensive summer internships involve a five-day work week (from 8:00 am to 4:00 pm) and the center can assist interns with finding local housing if needed. The full-time internship is an 8-week program and is offered in the fall, winter, and spring. There is housing available for a one-time deposit of $150 and $75 per week in rent. The Kentucky Reptile Zoo internship program offers interns the chance to work at a well-known herpetology center for three month periods. Students will handle snakes and other reptiles, give educational speeches to visitors and complete an independent research project. College students, or recent graduates, from an area of the biological sciences, are given preference during the application process. There is an internship in each of the four seasons. Housing and a small weekly stipend are provided. 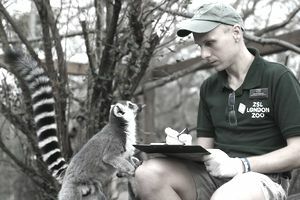 The Duke Lemur Center (in North Carolina) offers an unpaid animal husbandry internship that allows interns to work with over 250 animals, primarily lemurs but also other species such as bushbabies and lorises. Intern duties include daily care, cleaning, diet preparation, assisting with behavioral and veterinary work, and recordkeeping. Summer internships run for an eight-week period and require a five-day work week, including one weekend day. Housing is not provided. The Big Cat Rescue internship (in Florida) allows interns to gain experience working with lynx, bobcats, servals, ocelots, and more during the introductory internship. After completion of level one, students may move on to work with tigers, lions, leopards, and cougars. The level 1 internship is unpaid and lasts 12 weeks, with interns working five to six days per week. Free housing is provided. Level 2 (cougars) and level 3 (lions, tigers, leopards) interns receive a small stipend. The Black Pine Animal Sanctuary (in Indiana) offers an exotic animal care internship that runs for 10 weeks with 400 hours in total. Animals on site include ostriches and emus, parrots, lions, tigers, cougars, bobcats, primates, reptiles, and bears. No housing or stipend is available, but college credit is possible. The Mystic Aquarium (in Connecticut) offers many internship programs that include sea lion husbandry, pinniped husbandry, beluga whale husbandry, penguin husbandry, and more. Interns are involved in a hands-on capacity with tasks such as feeding, performing habitat cleaning activities, behavioral enrichment, training, record keeping, and assisting with veterinary procedures. Internships are open to current college students or recent graduates. Housing is not offered, and while these opportunities are unpaid, college credit is possible. If none of the ten opportunities above are what you are looking for, there are other opportunities on the animal-related internship sites marine animal internships and wildlife rehabilitation internships.